Dirty Rice | Time to Cook! My mother-in-law Patsy is from New Orleans and she is a great cook. She can do all of the New Orleans specialties – homemade beignets, crawfish etouffee, shrimp creole, turkey and sausage gumbo, etc. She serves dirty rice as a side dish at Thanksgiving or Christmas dinner in place of stuffing or mashed potatoes. This dish is so incredibly flavorful. I sometimes serve it as our main course for dinner with a side salad. Every Mardi Gras (this year it’s on Tues., March 4th), I cook something traditional for dinner (complete with colorful bead necklaces and silly hats) so the boys will be aware of their heritage. Note: if the organ meat in the recipe grosses you out, try it without and I bet it would still be good. 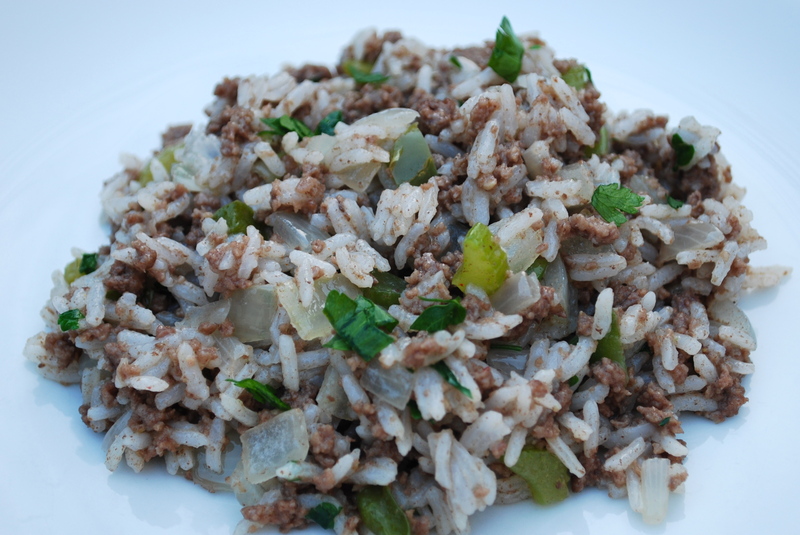 The original recipe calls for all organ meat, but instead, I use mostly ground beef and add just a bit of organ meat, which gives the dish a complex and rich flavor. Chicken livers and gizzards, although high in cholesterol, do offer a ton of vitamins and minerals (iron and zinc) and protein and are fine in moderation. You can ask for chicken livers and gizzards at the meat counter at Whole Foods. Recipe adapted from The New Orleans Cookbook. Add chicken gizzards and chicken livers to a small pot of boiling water and simmer for 15-20 minutes. Remove with slotted spoon and purée in blender (I use a Mini Prep Processor). Set aside only 1 tablespoon of this puréed organ meat for the recipe; discard the rest. Heat the oil in a large heavy skillet or Le Creuset and cook the ground meat until it begins to brown. Add the flour, garlic, onion, celery, and green pepper and mix well. Cook until the vegetables begin to turn soft and slightly brown. Add 1 tablespoon of puréed organ meat to the skillet along with the salt, pepper, cayenne pepper, most of the parsley, and 2 tablespoons of water. Cook over low heat for a few more minutes, adding a bit more water during cooking if necessary. Remove skillet from heat. Toss in the cooked rice and stir; serve hot. Garnish with a bit of parsley. Combine all the ingredients in a heavy 3-quart saucepan with a tight-fitting cover and bring to a boil over high heat. Stir once with a fork, then cover tightly and reduce the heat to very low. Cook covered for exactly 15 minutes. Do not lift the cover during cooking. Remove the pan from the heat, uncover, and fluff the rice gently with a fork. Note: the rice will keep warm enough for serving second helpings if you use a heavy saucepan and keep it covered after serving. Another way to keep the extra rice warm is to put the covered saucepan in a pre-heated 175 degree oven. Do not keep it warm for more than 25 minutes.